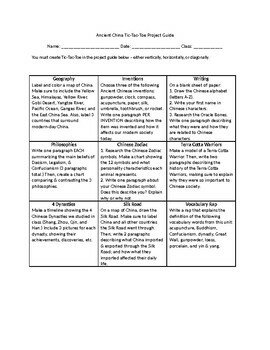 Great for use at either the end of a unit as a summative assessment, or to assign as an ongoing project during your unit on Ancient China! This sheet offers 9 creative project options - students have to create "tic-tac-toe" by completing 3 project options horizontally, vertically, or diagonally. I have left blank space at the top of the paper for you to add in your own instructions and project due dates. Great for all types of learners!